On 19 March 2012, the Tamil Nadu Government in India approved the commissioning of the Koodankulam Nuclear Power Plant (KNPP) and the repression on protesters against the nuclear plant has escalated since then. For 8 days, around 4000 state police and 400 central police officials literally laid siege to Idinthakarai, the village 6 km from Koodankulam which has been the hub of protests against KNPP. The police cut the power and water supplies, and restricted the movement of people and transportation of daily essentials, including milk for babies. The crack down prompted an indefinite fast by 7 women and 8 men. Thousands of people kept vigil in solidarity and support for the fasters. Police have arrested more than 203 peaceful protestors. Besides most of these arrestees, some of the fasters have also been charged with sedition and waging or attempting to wage war against government. The anti-nuke protesters are vilified as being influenced by foreign money and acting against the interest of the country, and having ?alleged connections? with Maoists ? a bogey raised by the police and the politicians to justify police excesses. The fast was suspended on 27 March 2012 upon the government?s promise to look into the demands of the protesters. The people are vigilant and waiting for government to take concrete actions in response to their demands. 2. To initiate due process for allaying people?s fears about the nuclear plant and for negotiating for their consent. 3. Diplomatic representatives of India in your countries. To immediately intervene in defense of human rights defenders in the Koodankulam struggle, particularly Dr. S. P. Udayakumar. 1. Diplomatic representatives of India in your countries. This is a sample letter for your reference. Please try to write it on your own and avoid typing ?cc ACPP? on any part of your letter. Please send us copies separately, for monitoring purpose. We write with grave concerns over the situation in Idinthakarai, in the Tirunelveli district of Tamil Nadu, the village closest to the Koodankulam Nuclear Power Plant (KNPP). Since 19 March 2012, the day your government gave a green signal for the commissioning of KNPP, the TN police have arrested more than 203 peaceful protestors including 30 children and 42 women. Those arrested are part of a mass movement (the People?s Movement against Nuclear Energy (PMANE)) that, since 2001, has raised legitimate concerns about the safety of the marine life and human lives, as well as the livelihood of thousands of people in and around Koodankulam on account of the proposed commissioning of the Nuclear Power Plant. In a democratic country, people should have a say in decisions that affect their lives and livelihood. Furthermore, we have been informed that most of these peaceful protestors have been charged with insurrection and sedition under Sections 121, 121A and 153A of Indian Penal Code and that 4000 state police and 400 central police literally laid siege to the people assembled at Idinthakarai, restricting movement of people and essential commodities into and out of Idinthakarai. The entire operation by the police gives the impression that Indian democracy has outlawed people?s right to dissent and protest ? a blatant violation of Article 19 of the Constitution of India and Articles 19 and 21 of International Covenant on Civil and Political Rights. We would like to remind you that the National Human Rights Commission approved, at the NHRC-organized Workshop on Human Rights Defenders in 2009 in New Delhi, 13 recommendations, stating that: ?? Human Rights Defenders should also be provided protection by the State against any violence, threats, retaliation, adverse discrimination, pressure or any arbitrary action as a consequence of their activities for promotion and protection of human rights and fundamental freedom. NHRC and SHRCs can play an important role in this regard.? In this connection, we appeal to you, Chairman, to immediately intervene in defense of the Human Rights defenders, in particular for Dr. S.P. Udaykumar, convener of People?s Movement against Nuclear Energy (PMANE) and the hundreds of arrestees. The Koodankulam struggle began shortly after the Soviet President Mikhail Gorbachev and Indian Prime Minister Rajiv Gandhi signed the Koodankulam Nuclear Power Project deal in 1988. In 1989, the Samathuva Samudaya Iyakkam (Social Equality Movement) organized people from the three districts of Tirunelveli, Kanyakumari and Tuticorin for a massive rally against the proposed nuclear plant and a million signatures against the nuclear plant were handed over to Gorbachev when he visited India. In 2001, the people came together again under the banner of People?s Movement Against Nuclear Energy (PMANE) to oppose the expansion of the plant from two to six nuclear reactors. Despite the intensified but unsolved concerns of the local residents, the Government went ahead with the construction of the nuclear plants, paying no heed to popular opposition. Construction of two VVER-1000 nuclear reactors had been completed and the first reactor was ready to be commissioned by December 2011. But the Fukushima disaster in Japan (March 2011) reinforced the peoples? fear quotient and their concerns about the safety of human lives and marine life, as well as concerns about their own livelihood. Hence, the people?s 20-year long struggle for closure of KNPP intensified. As many as 127 people undertook a 12-day long hunger strike in Idinthakarai from 11 September 2011; more than 15,000 people ? across caste, religious and political barriers, a camaraderie rarely seen in Tamil Nadu ? gathered at Idinthakarai every day, in solidarity with the fasters. 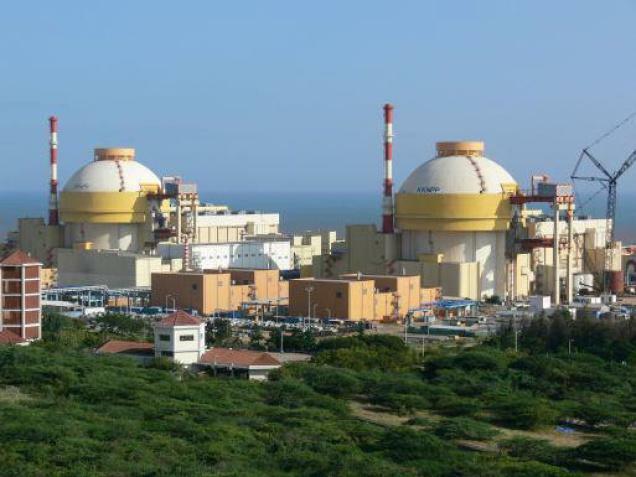 On 22 September, the Tamil Nadu cabinet passed a resolution urging the Prime Minister and the Government of India to suspend work on the nuclear power plant ?until the apprehensions of the people are allayed?. However, the Federal Government persisted and protesters resumed their hunger-strike and blockaded access to the KNPP. When the Tamil Nadu government gave the approval on 19 March for commissioning the nuclear power plant, more than 5,000 people quickly assembled in protest. On the same day, 203 peaceful protesters were arrested, prompting Dr. S. P. Udaykumar and seven other men and seven women to begin an indefinite hunger strike demanding for their release. People were arrested under Sections 121 (‘Waging, or attempting to wage war, or abetting waging of war, against the Government of India’ ? Capital punishment could be awarded to the accused on conviction), 121A (‘Conspiracy to [. . .] overawe, by means of criminal force or the show of criminal force, the Central Government ? the punishment for this offence could be a life sentence) and 153A (‘Promoting enmity between different groups on grounds of religion, race, place of birth, residence, language’) of the Indian Penal Code. In a move to further intimidate the people, 4000 state police and 400 central police were deployed. The police cut the power and water supply to the village, blocking the entry of essential commodities to the village (like milk for babies). On 27 March, on its 9th day, the fast was called off following a dialogue between 12 representatives of the protesters and the Collector of Tirunelveli district and senior police officers of the district. Although the government officials have assured them that their charter of demands would be conveyed to the government for consideration, the protesters have begun a relay fast and have declared to strike work until their key demands are met. The protestors demand release of all arrestees, immediate withdrawal of cases filed against them, and recognition of their struggle against nuclear energy. Other demands include training for people in 32 villages in disaster management, an ‘open and frank’ nuclear liability bill and explanation to locals on how safely nuclear waste would be disposed. Local Contact, Forum-Asia, Asian Human Rights Commission Statement, Times News Network, The Hindu, www.tinyurl.com and http://www.youtube.com/watch?v=xloBd59xC7I. Hotline Asia is a service for Justice and Peace irrespective of class, race, religion, culture and political affiliation. We issue Urgent Appeals on request from our network. As you receive Urgent Appeals, we welcome contributions payable to Asian Center for the Progress of Peoples Ltd.
ACPP gratefully acknowledges the support of Cordaid, Missio, Misereor and One Body One Spirit for Hotline Asia.